Groups provides a way to organise users. This allows you to direct notes and send messages to more than one user at a time by only adding one recipient, and also assign a task to a group rather than to a single user only. The administering of groups is only available for users with the user management permission. Users can be organised by department, location, skill set or any other way you see useful. A user is called a member when added to a group. 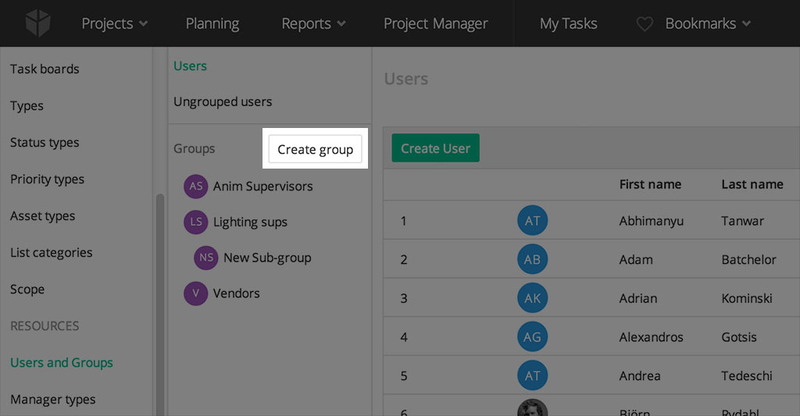 This can be done globally from System settings ‣ Resources ‣ Users and Groups, and per project from each project’s Team page that you can reach from the project outliner. To create a new group, click Create group in the Groups header to the left. A new group will be instantly created. Each new group will have a default name. Click on the group name in the top to rename the group. The name is saved automatically when clicking outside the text field. If you would like to divide your group into smaller groups, click the Create sub group button. A new sub group will then instantly be created under the currently selected group. 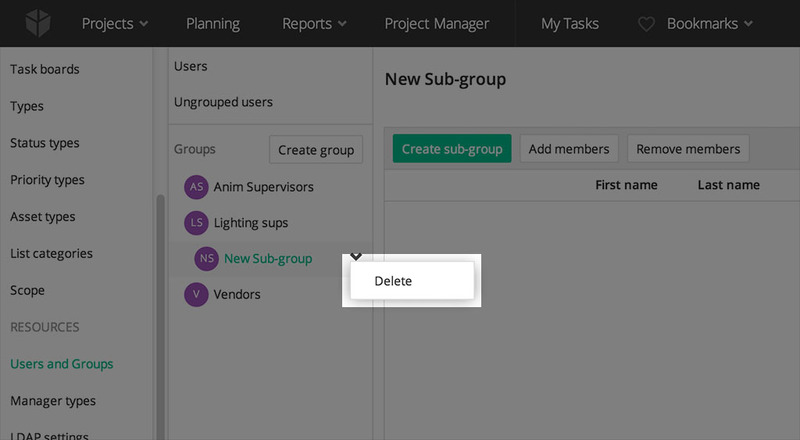 Click the name of the group or sub group that you want to manage members for in the list to the left. That will load all members of the selected group. To add a member to the group, click the Add members button. Select the users you want to add as members to the group in the dialog that opens and click Save when you are done. To remove a member from a group, select the member in the list and click Remove members. You can remove multiple members at once from a group by selecting more than one in the list and clicking Remove members. To remove a group, move your mouse over the group name in the list to the left and click the small arrow that appears to the right. Select Delete in the context menu to delete the group.